What is the impact of organisational knowledge loss due to employees leaving? How is diversity management linked to trust in the workplace? Does alertness management training work for workers who suffer from sleepiness at work? An interesting new study about emotional resilience in children has interesting findings for adults in organisations. Previous studies have found that children who grow up in conditions of poverty are significantly more likely to develop maladaptive behavioural, emotional and cognitive development traits, compared to children growing up out of poverty. However, this is not the case for all children, some of them show that they are able to overcome the adversity that poverty brings and show resilience. This briefing provides a number of really interesting and very useful findings about the nature of resilience and exactly how some people become more resilient than others. Projects are ubiquitous. Even the smallest company with just one or two employees has to run projects in order to achieve their goals. The point of project management is to try to ensure that the plan materialises in a timely and cost-efficient manner and either achieves or exceeds its goals. Project management, as a practice, ranges from the chaotic and opportunistic to projects where almost every variable is scoped, mapped out and costed, in terms of time and other resources needed. This briefing shows 5 key things large organisations need to learn from the way small and medium enterprises manage projects. This briefing will be of particular interest to anyone running or managing projects of any type. Knowledge about how an organisation works and each of the components of an organisation’s operation is stored and distributed in many places. A good knowledge management system will capture and manage a lot of this knowledge, however, organisational knowledge loss has been found to have devastating potential. A study in 2010 found that organisational knowledge loss was one of the most important risks to an organisation or company. This briefing looks at a study that lays out exactly what the issues organisations face but are often fatally blind to around knowledge loss. One of the primary issues of evidence-based practice implementation is how to get people in organisations to integrate their day-to-day practices with the best research. Practitioners and organisations tend to be largely practice focused, making decisions mainly based on a mix of experience, cultural precedents, organisational procedures, policies, systems and internal data. Integrating good research into this practice-based process is frequently not a simple development. As any evidence-based practitioner will know, there is a wealth of useful research out there, to help to make more informed and better decisions. Ignoring this source of information (research evidence), which is often garnered from wider sources than those used in decision-making within organisations, can lead to incomplete or faulty decision-making. Further, the ability of an organisation to find and assimilate good research findings can lead to significant innovation and organisational improvements. A range of previous studies have found that integrating research evidence into internal practices and procedures, as well as using it for product and service development purposes, can have a significantly positive impact on organisational outcomes, including profitability, service delivery, effectiveness and a range of other outcomes. This research briefing looks at research that helps practitioners build organisational level capacity to implement evidence-based practice and to highlight the issues involved. A new study by a team of researchers has looked at what differentiates harmonious relationships from non-harmonious relationships between inter-ethnic pairs. This research briefing will be most useful for managers and professionals in diversity and human resources roles. Some of the fastest growing and most common reasons for work absence include stress, depression, anxiety and a range of other negative mental health issues, and yet not everybody succumbs to these health issues. Indeed, you can have two people doing a similar job in similar circumstances, at the same time, and one will thrive in those conditions and the other will develop severe mental health issues. Understanding what leads to either outcome is important, not just for the individuals concerned, but also for the organisations they work in. This briefing will be really useful to anyone who suffers from stress, anxiety and depression as well as anyone in Human Resources, management or involved in mental health at work issues. One of the critical success factors for organisations in fast-moving, volatile and hypercompetitive business spaces is innovation. The effectiveness of an organisation’s innovation capability can often make the difference between a prospering organisation and a failing organisation. Previous studies have found that innovation effectiveness within organisations largely depends on good knowledge management and the involvement of employees, particularly knowledge workers. Often it is knowledge workers who convert innovative ideas into commercial products and services. Adaptable organisations understand the need to enhance innovative behaviours in the workplace, and they understand that knowledge management is central to this. This briefings looks at a new study just published which looked at finding out whether financial incentives (pay-for-performance), psychological empowerment and work engagement are connected and whether they enhance innovation behaviours and innovation effectiveness. This research briefing will be useful for managers, human resource management professional and anyone in organisational development or concerned with increasing innovation capability in their organisation. The ability of an individual to tolerate distress (distress tolerance) is becoming an increasingly important concept in the world of psychology, work psychology, leadership, management, human resource management and organisational development. Distress tolerance refers to an individual’s perceived capability or their actual ability to endure negative emotional or physical discomfort and predicaments or situations, before trying to deal with the distress by flight, avoidance or maladaptive behaviours, including aggression. This research briefing looks at a new study to assess how different people respond to different levels of challenge and has some interesting and useful findings particularly for leaders, coaches, managers and anyone in HR. Having good diversity processes includes a lot more than just employing a diverse range of staff. Diversity management refers to the process of not only having an inclusive recruitment policy and process, but also of ensuring inclusion within the workplace and ensuring that all management practices policies and procedures are fair and inclusive in themselves. The aim of diversity management is to ensure that all employees feel that the management and the whole organisation is fair and inclusive. 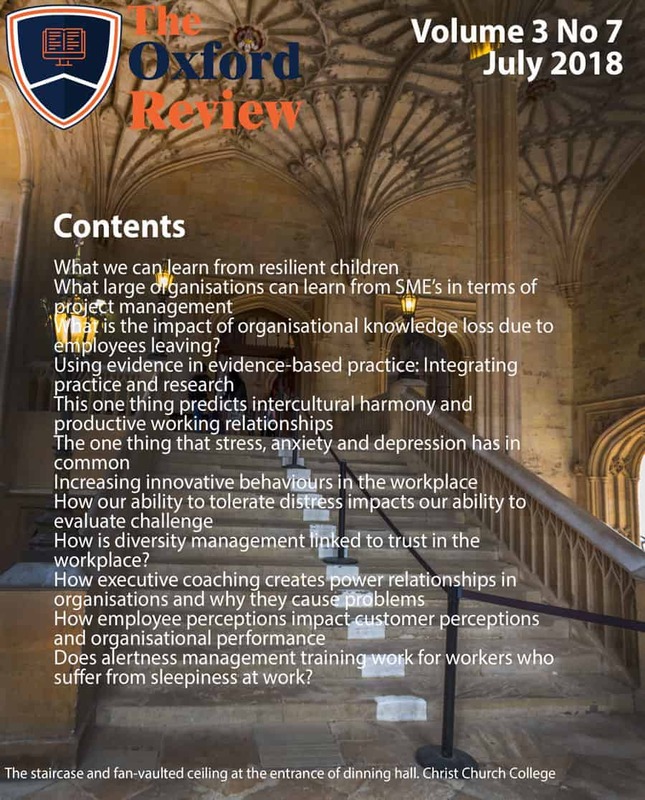 This research briefing examines a new systematic review of research which looks at establishing what links there really are between diversity management and employee trust. This briefing will be useful to anyone involved in diversity issues at work. There has been much interest in the world of coaching in recent years, both within organisations and research circles. In particular, there has been an exponential growth in research interest in executive coaching as a form of leadership and management development. Annually, there are approximately 20,000 peer-reviewed studies on coaching in general and an average of 4 – 5,000 new peer-reviewed research papers around executive coaching, in particular, every year. The researchers looked at the practice executive coaches coaching in organisations within the United States and the United Kingdom to see how executive coaching id effected by organisational politics and how coaching impacts the power relationships, both within the coaching relationship and the organisation. This briefing is essential reading for any coach engaged in executive coach and anyone managing coaching services in their organisation. In a whole range of industries one of the most robust predictors of organisational performance has been found to be the reactions and perceptions of customers to the service they receive. Whilst this factor (customer perceptions and reactions) appears to be divorced from human resource practices, there is, in fact, a close connection. A new study has looked at whether, and how, employee perceptions of their work impacts the customer’s perceptions and reactions to the product, service and hence impacts the organisation or company involved. The issue of sleepiness at work is a serious one in many professions. People feeling sleepy, or actually falling asleep at work, can have serious health and safety consequences, but also lowers productivity and can cause a range of other issues to do with a lack of focus, engagement and work absorption. Sleepiness at work is a particular problem for shift workers, long-distance drivers, people engaged in monotonous work and employees who are exhausted. This is particularly an issue where alertness needs to be maintained for safety or productivity reasons. This research briefing looks at a new study by a team of researchers looked at the effectiveness of alertness management training which will be useful for anyone who suffers from sleepiness at work or who is involved in management tor health and safety.